Recently Keith is beginning to demand a lot of things especially wanting to go out all the time. Even when someone takes him out he is very cautious, especially when Elaine or I is not around. Once he even cried until he vomited when Grandma took him out for a ride with my sis in her car. Nowadays he would start crying as soon as he board a car with someone other than Elaine or me. Even when he got onto the car he would keep wanting to be on the driver's seat! And he sure likes to play with the wiper and the high beam controls. 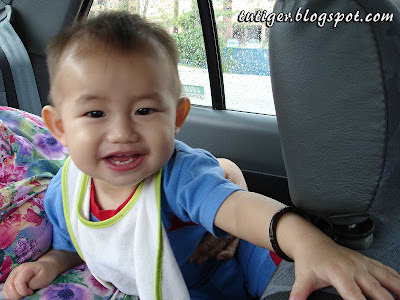 This was taken when I went out with Grandma and him to renew my road tax and insurance on Monday. I needed to make this run on my own because I needed to clear up my NCB from my previous car into this car, which have been pending at the insurance company for a rather long time. Take a close look at Keith's teeth and you can see the stumps of his lower canine (cuspid) teeth. Actually he is having a rather tough time because when I feel him gums I can feel that it is 4 canine (cuspid) teeth with 2 lower first molar.